Brief Synopsis – A docudrama that tells the story of a hostage crisis as it happens told solely from the perspective of news cameras. My Take on it – This is definitely a film that was ahead of its time. The concept of telling an entire story via the viewpoint of a news cast is genius. 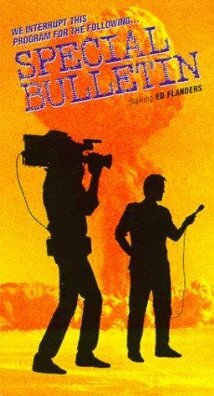 Unlike in 1981 when this film was made, the world today lives on the edge of the instat and when major events happen, we all find ourselves glued to the TV watching everything unfold minute by minute. I personally recakll how I camped out in front of CNN to watch the First Gulf War as the airstrikes over Baghdad began, the tense final minutes of the 2000 US Presidential Election (which went on for weeks) and of course the 9/11 attacks. THis film takes a fictional terrorist attack and takes us through it step by step as it happens entirely via the use of reporters on the scene, around the country and of course in the newsroom. Nothing is hown not via the lens of a news camera and it can work very well as being mistaken for a real life event. When it aired on TV in 1981, not unlike War of the Worlds in the 50’s, they needed to constantly remind the audience that they are not watching real events over and over. Being the way that this was filmed, I’m not surprised at all that it was able to win an Emmy for Best Drama Special and Best Writing for a Special. Most of the cast is completely unknown which makes it feel even more realistic as a newscast. The choice to use Ed Flanders (of St. Elsewhere fame) as the main news anchor works well and for me brought a bit of familiarity to the man we need to trust onscreen. Bottom Line – What an amazing concept! To show an entire story solely via the lenses of news cameras as the reporters inform us as to what is going on minute by minute. I’m not surprised that this was able to win four Emmy’s including an Emmy for Best TV Special. Concept was definitely well ahead of it’s time. Most of the cast are completely unknown, but I liked Ed Flanders as the Anchorman reporting on it all as it unfolds before our eyes. Highly Recommended!